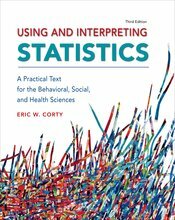 Eric Corty’s engaging textbook is exceptionally well suited for behavioral science students studying statistical practice in their field for the first time. An award-winning master teacher, Corty speaks to students in their language, with an approachable voice that conveys the basics of collecting and understanding statistical data step by step. Examples come from the behavioral and social sciences, as well as from recognizable aspects of everyday life to help students see the relevance of what they are studying.